Life is challenging for many of us; for some of us, it is downright tough. So why do some people thrive while others in similar circumstances spiral downward? To answer this question, Pastor Bob Merritt of the huge Eagle Brook Church wrote this book. 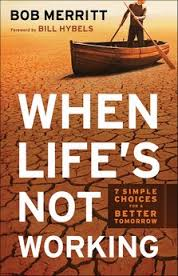 When Life’s Not Working: 7 Simple Choices for a Better Tomorrow outlines the choices each of us can make that will ensure that our lives, while not easy, will not be unnecessarily hard. In fact, the self-discipline involved in these 7 choices will prepare us to live well and wisely, to God’s glory. In the process, you’ll also need to humbly work on your character flaws, trusting God to change you as you pursue Him and flee sin. Above all, you’ll need to learn how to love and forgive the people in your life, starting now. In a chatty style, using stories and Biblical explanations, Bob Merritt passes on knowledge that we can all use. Despite some errors in fact and emphasis, this is an enormously practical book. Whether you are currently in a tough situation or just living everyday life, you will benefit from Bob’s reminders of how God has built cause and effect into our world. Of course, this earth is not heaven, and Biblical self-discipline will not guarantee a pain-free life. However, the principles in When Life’s Not Working will allow us to avoid the unnecessary losses and setbacks that plague those who do the wrong things in the wrong order. Even more, they will allow us to glorify God in the things that we do, rather than discredit Him. Although I’m not currectly in a tough stage of life, When Life’s Not Working has led me to make some important changes and decisions. I recommend this book to all my readers for their personal benefit. It would also be excellent reading for teens as part of a high school program. Do check out the beginning of this book to see if it might benefit you. This is my 15th book in the 52 Books in 52 Weeks Challenge. Great strategies and so simple. Sounds like an interesting, helpful book.